The Rocking Moon Game is a fun toy that can be enjoyed by both children and adults. By rolling dice to select blocks, the game begins and challenges players to use strategy to keep the blocks from falling off of the rocking moon. 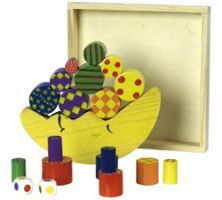 Complete with colorful dice and block pieces, this toy set is the perfect bonding activity for any family with young children. Ages 3+.